Five years ago, the young witch Bromwyn refused a gift from the powerful fairy king. Tonight, on Midsummer, that decision comes back to haunt her. 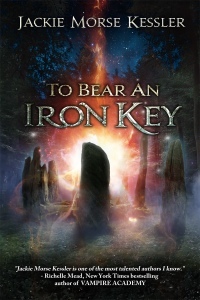 When her best friend Rusty picks the wrong pocket, he and Bromwyn are all that stand between their village and the rampaging fairies who have pushed through the World Door. If they cannot outwit the fairy king and queen before the World Door closes at sunrise, the friends will lose everything -- their village, Bromwyn's magic, and Rusty's life. You’re home alone, there’s a fire! Top 3 things you’d grab and save from the fire? Top 3 Favorite authors (dead or alive) and why? JMK: Neil Gaiman – Ever since I read The Sandman comic book series, I’ve been enamoured with his storytelling. He’s my single biggest inspiration for being a writer. 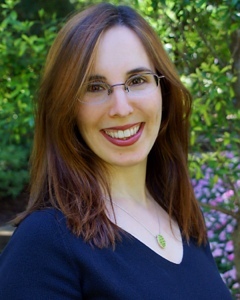 Jim Butcher – Harry Dresden is my hero, and I have the button to prove it! A.S. King– Her books are personal and powerful, funny and tragic, and quietly extraordinary; they should be required reading. Top 3 Favorite snacks while writing and why? JMK: Chocolate, chocolate, and chocolate. Because: chocolate!!! Top 3 Favorite books that inspired you to write and why? Top 3 favorite songs to listen to while writing and why? JMK: This is different for every book I’m writing. I didn’t have much of a playlist for TO BEAR AN IRON KEY, but an old friend once told me that Bromwyn’s theme song should be “Jig of Life” from Kate Bush’s Hounds of Love. Top 3 favorite techniques to overcome writers block and why? Top 3 musicians/bands/groups and why? Top 3 favorite movies of all time and why? JMK: Say Anything, because it’s insanely romantic; Heathers, because it’s insanely dark; and The Breakfast Club, because it just hits it on the head in so many ways. Top 3 favorite actors/actresses and why? JMK: Matt Damon, because he’s my boy; David Tennant, because the Tenth Doctor is my Doctor; and Zachary Quinto, who **killed** it as Spock (and the first two seasons of Heroes). 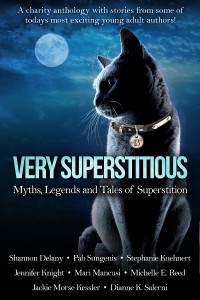 Click here to visit more stops on the 'Very Superstitious' Blog Tour, including guest posts by the writers, reviews, and interviews.